The British Isles are defined by the colour green. It should really be represented on our national flag, or at the least extolled by our national anthem. Perhaps if Scotland goes its own way the country can adopt green in place of the white-on-blue cross of St Andrew. 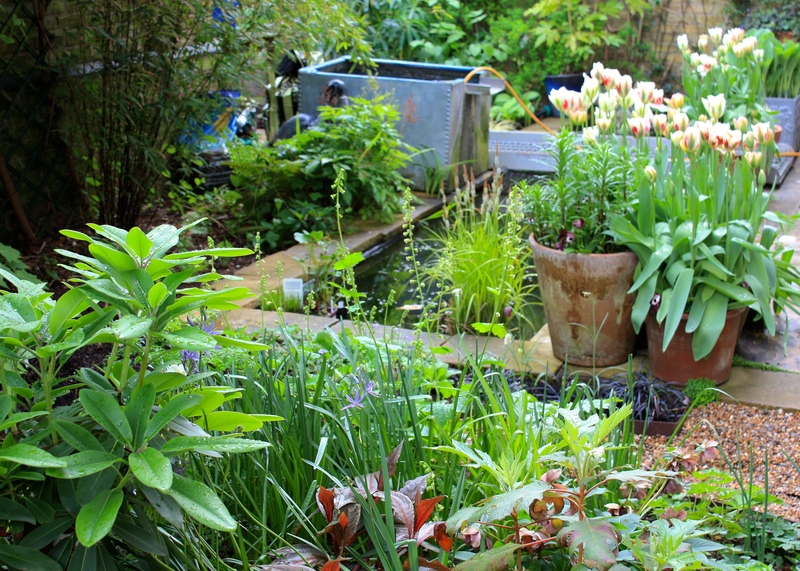 If green was the national colour, our London garden might be deemed especially patriotic at the moment. There are minor smudges of blue in the form of Camassia leichtlinii ssp suksdorfii caerulea (try pronouncing that after a stiff G&T) and Omphalodes cappadocica ‘Cherry Ingram’, but otherwise it’s emerald, lime, olive, chartreuse and jade all the way. This year’s tulips are all Viridfloras: T. ‘Greenland’ (blush and green), T. ‘Flaming Spring Green’ (scarlet, white and green) and T. ‘Spring Green’ (plain old white and green). Together they make a lovely combination, packed into an assortment of large terracotta pots. It’s an annual expense I would never spare; more is more when it comes to tulips. Whilst one really can’t go wrong with green, too much of the same tone can be monotonous. The trick is to vary the composition with different shades and textures. Right now I am absorbed by the development of a single, arching stem of Polygonatum x hybridum ‘Betberg’ (below), which has emerged effortlessly from our heavy soil bearing leaves of the most extraordinary purply jade. White flowers lay in waiting beneath, but will play second fiddle to the foliage. I suspect it may take many years for this dramatic beauty to make a big clump. It will be worth the wait. 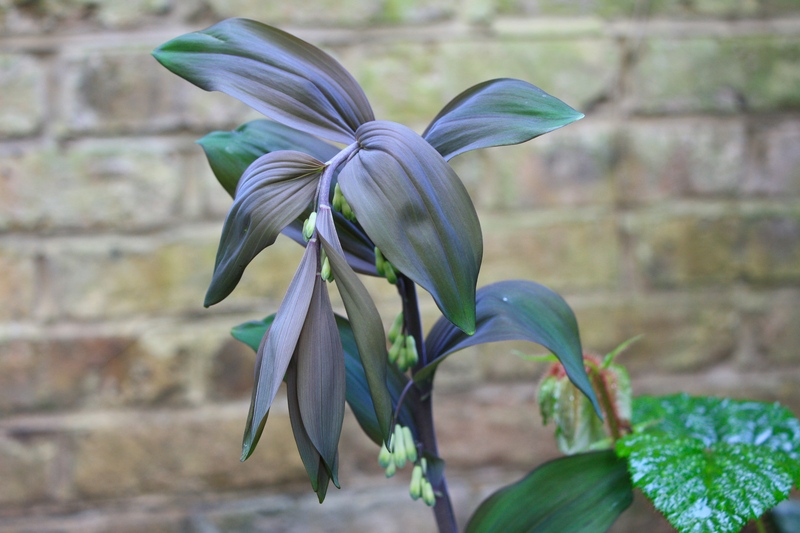 Another very special plant which seems to tolerate our soggy London clay is Disporum megalanthum, which is supposedly very rare in cultivation. It appears routinely by our pond each spring with glossy olive-green leaves and white campanulate flowers, followed by blue-black fruits later in summer. I love it for its tolerance of our neglect far more than for its rarity. Last year we planted several slower growing hostas including H. ‘St Paul’ and H. ‘Guardian Angel’, both of which I hope to take a decent snap of soon. They are living up to their reputation, emerging hardly any larger than they were last year. If it were not for their lovely foliage they might sorely test my patience, which I find is lessening with age. 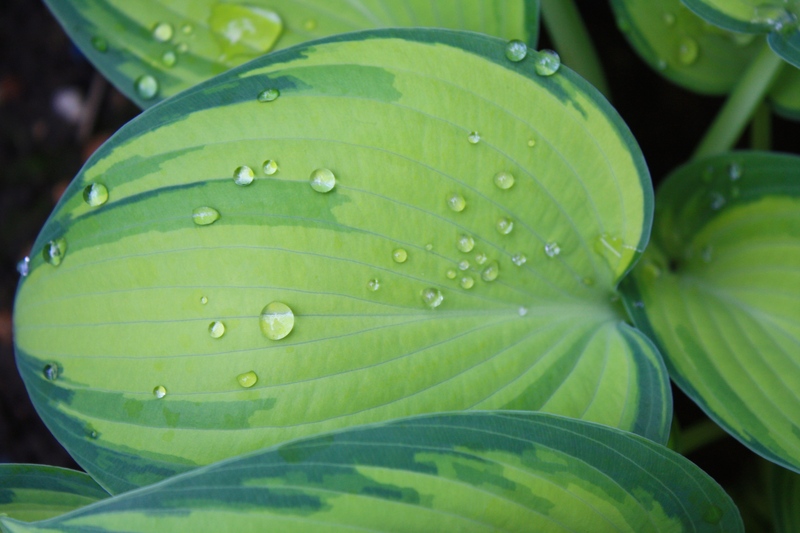 Less reluctant to get going is Hosta ‘June’, which is already forming pert clumps of neat, prettily marked, heart-shaped leaves. Mercifully unblemished, they look all the more attractive studded with drops of rain. Yesterday, when putting up wires for a new clematis, I reminded myself how lucky we are to be surrounded on all sides by lovely golden brick walls. They afford the garden shelter and structure, allowing us to keep tender plants such as Dicksonia antarctica growing through even the coldest of winters. 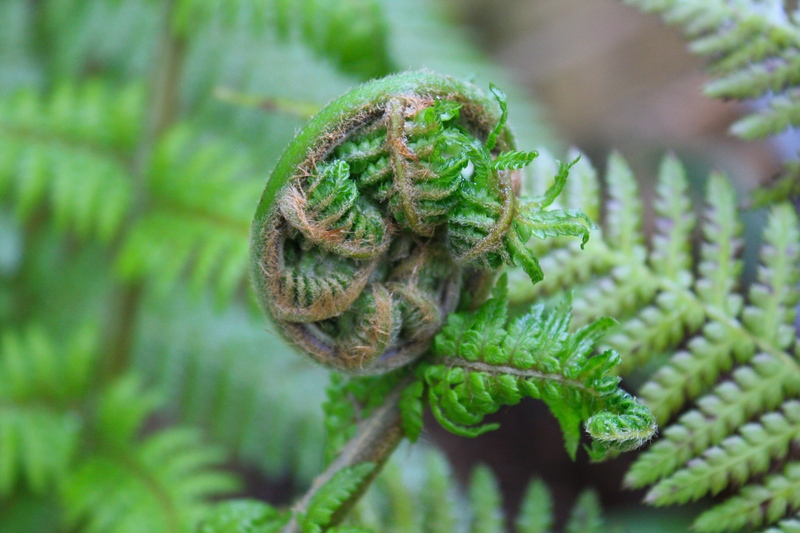 It is with much excitement that I observe the unfurling of the new fronds each spring. This year they are more plentiful than ever and promise to spread their filigree shade over a carpet of Galium odoratum which is gradually creeping up its trunk. Ferns represent green at its very best; fresh, vital and mossily aromatic. Far from bemoaning the current scarcity of flowers, I am revealing in this brief moment of green, soon to be eclipsed by the brightness of summer. I know you love a good hosta Judy! I am a bit sad that I don’t have space for any more …. well, maybe I could squeeze a couple in! I really like your colour combinations and laughed at your narrative this morning, I know that feeling of less patience. 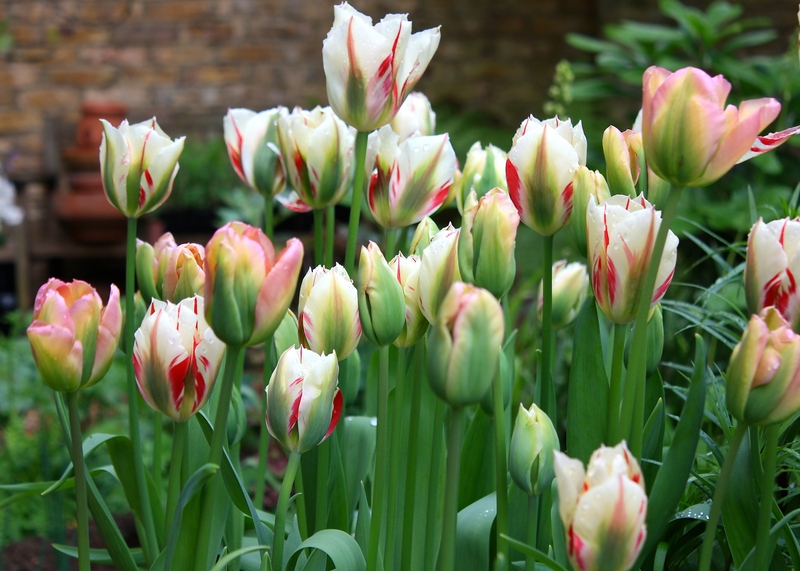 I cannot make my mind up about the Viridflora tulips, I love your photographs of them though. Do you change your Tulips each year? I do Julie, but in doing so I think I have missed opportunities to refine my combinations. I am wondering if next year I should just move things on a little with a few new varieties. However when it comes to it I won’t be able to resist one variety or another and will find myself with another highly experimental mix!